Experience the best in pampering at the Spa Luce in the heart of Hollywood this year. Try a side-by-side special pedicure, enjoy lunch by the pool, take a vitalizing steam or sauna. Watch the excitement at the Kodak Theatre, or do what all good mom's and daughter's do best -- go shopping! Beverly Hills: In honor of all the wonderful things moms do, Montage Beverly Hills invites families to do something wonderful for Mom this Mother�s Day, Sunday, May 9th. A beautiful brunch: Treat Mom to an elegant brunch buffet in the Marquesa ballroom adorned with grand chandeliers, a soaring ceiling, opera balconies and twinkling wall sconces all which lend a sense of grandeur to any occasion. Celebrate Mom to the sounds of a jazz trio that will accompany the hotel�s new �Krug Mother�s Day Champagne Brunch�. Toast Mom with a flute of Krug Champagne and dine to your heart�s content at the 10-station holiday buffet. To commemorate the day, pose for photos with Mom compliments of Montage Beverly Hills. The buffet also includes a special gift for your special Mom. Brunch from 10:30 a.m. to 1:30 p.m.; $95 adults, $25 children. Call 310-860-7800 for reservations. A lovely lunch: At Parq restaurant, delight in the garden views and the spring blossoms of the Beverly Canon Gardens. Your family can enjoy a special four-course prix fixe lunch that includes a glass of Krug Grand Cuv�e Champagne upon seating. Appetizer choices include a Corn Agnolotti accented with fava beans and pea tendrils, or Roasted Red Pepper and Tomato Soup, touched with a bit of basil and creamy burrata. The second course features the freshest spring greens in two salads, one adventurous (cantaloupe, ricotta salata and lemon vinaigrette) and one familiar, the classic Caesar. Entr�e choices include a hearty Braised Veal Cheek accompanied by risotto alla carbonara or a delicate, Roasted Halibut with grilled peaches and pistachios. After lunch, guests may adjourn to Parq�s European-inspired display kitchen where Executive Pastry Chef Richard Ruskell will create his legendary dessert buffet. Lunch from Noon to 3:00 p.m.; $85 adults, $25 children. Call 310-860-7970 for reservations. A Mother-Daughter Day at Spa Montage: Give Mom the ultimate gift of �relaxation� with a day at the lavish Spa Montage. The two-story urban oasis features unparalleled facilities including 17 treatment rooms, club-style locker rooms with steam, sauna, Swiss shower and a private mineral pool. Enhance your mother-daughter spa day with Spa Montage�s new manicures and pedicures from Spa Ritual, vegan and paraben-free products dedicated to the environment. With over 80 shades, choose to energize, balance, or relax with organic ingredients like moisturizing Italian Mandarin Oil, Indonesian Ginger, or French Lavender. And from now until the end of June, make Mom the guest of honor at a specially priced Spa Montage Soiree with up to 14 of her closest friends. 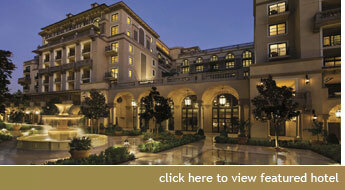 For more information on Spa Montage or the Spa Montage Soiree, call (310) 860-7840. A taste of tiny treats at Afternoon Tea: Mom knows that any day is a good day if it includes the famed Afternoon Tea service in the Lobby Lounge. Indulge in the tiered trays of delectable sandwiches, cakes and pastries such as Peanut Butter Chocolate Kisses and Banana Mousse �clairs topped with chocolate from Chef Richard�s new Afternoon Tea pastry menu elegantly presented on the hand-painted porcelain tea china, all in the comfort of the Lobby Lounge�s plump upholstery. Dad can have a heartier repast by ordering the Gents� Tea, which features sliders, chocolate cake and scotch or iced tea. Afternoon Tea served 2:30 p.m. to 5:30 p.m. daily; from $28 to $40. For reservations, call 310-860-7800. A Gift Card for a Get-Away: The Montage collection of distinctive luxury hotels offers a world of unforgettable experiences that can be pre-purchased online. The website, www.montagebeverlyhills.com links to a page that can select and track gift card purchases of up to $25,000. Cards can cover a weeks-long long spa vacation, a weekend to explore Beverly Hills or a refreshing lunch at the rooftop Conservatory Grill after a day of shopping on Rodeo Drive. Awarded Forbes Five Star in groundbreaking time, Montage Beverly Hills features 201 well-appointed guestrooms, including 55 suites, paying tribute to both old-style Hollywood and modern day luxury. The exterior, designed in the Spanish Colonial Revival style complements the rich history and tradition of Southern California�s most celebrated neighborhood. Located steps from Rodeo Drive, in the heart of the Golden Triangle, guests and residents find convenient access to luxurious retailers and exquisite dining. Through every facet, Montage Beverly Hills embodies the essence of Hollywood�s Golden Age. With our commitment to sustainability, Montage Beverly Hills was the first hotel and residences to receive Gold LEED certification in Southern California. For information and reservations, please contact Montage Beverly Hills at 310-860-7800 or visit the Web site, www.montagebeverlyhills.com.